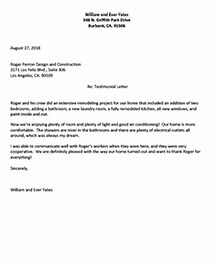 Yates » Roger Perron Inc.
Roger and his crew did an extensive remodeling project for our home that included an addition of two bedrooms, adding a bathroom, a new laundry room, a fully remodeled kitchen, all new windows, and paint inside and out. Now we’re enjoying plenty of room and plenty of light and good air conditioning! Our home is more comfortable. The showers are nicer in the bathrooms and there are plenty of electrical outlets all around, which was always my dream. I was able to communicate well with Roger’s workers when they were here, and they were very cooperative. We are definitely pleased with the way our home turned out and want to thank Roger for everything!